Reset service light indicator Nissan Rogue. From years: 2010, 2011, 2012. How to reset service light indicator Nissan Rogue. From year: 2010. Odometer/twin trip odometer Nissan Rogue. 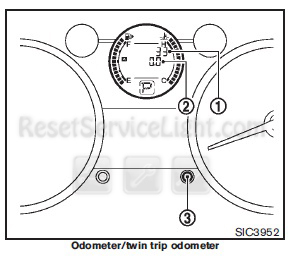 The odometer 1 /twin trip odometer 2 are displayed when the ignition switch is in the ON position. The odometer records the total distance the vehicle has been driven. The twin trip odometer records the distance of individual trips. TRIP A ? TRIP B ? Trip computer mode (if so equipped) ? TRIP A. For trip computer information, see “TRIP COMPUTER” later in this section. Pushing the reset switch3 for approximately 1 second resets the trip odometer to zero. Button 3 in the picture above becomes button A. TRIP COMPUTER Nissan Rogue (if so equipped). The switch for the trip computer is located on the meter panel. When the ignition switch is turned to the ON position, modes of the trip omputer can be selected by pushing the trip computer mode switch A. (TRIP A -> TRIP B -> ) Distance to empty (dte) -> Average fuel consumption -> verage speed -> Elapsed time ( -> TRIP A). Distance to empty Nissan Rogue (dte — mls or km). The distance to empty (dte) mode provides you with an estimation of the distance that can be driven before refueling. The dte is constantly being calculated, based on the amount of fuel in the fuel tank and the actual fuel consumption. The display is updated every 30 seconds. The dte mode includes a low range warning feature. When the fuel level is low, the dte mode is automatically selected and the dte display will blink. Push the trip computer mode switch A to return to the mode that was selected before the warning occurred. When the fuel level drops even lower, the dte display will change to “——”. If the amount of fuel added is small, the display just before the ignition switch is turned off may continue to be displayed. When driving uphill or rounding curves, the fuel in the tank shifts, which may momentarily change the display. Average fuel consumption Nissan Rogue (mpg or l (liter)/100 km). The average fuel consumption mode shows the average fuel consumption since the last reset. Resetting is done by pushing the trip computer mode switch A for approximately 1 second. The display is updated every 30 seconds. At about the first 1/3 mile (500 m) after a reset, the display shows “——”. Average speed Nissan Rogue (mph or km/h). The average speed mode shows the average vehicle speed since the last reset. Resetting is done by pushing the trip computer mode switch A for aproximately 1 second. The display is updated every 30 seconds. The first 30 seconds after a reset, the display shows “——”. The elapsed time mode shows the time since the last reset. The displayed time can be reset by pushing the trip computer mode switch A for approximately 1 second. Push the trip computer mode switch A for longer than 3 seconds. The average fuel consumption, average speed, elapsed time and trip odometer (TRIP B only) displays will be reset at the same time. 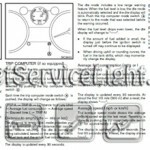 The full procedure how to reset service light indicator Nissan Rogue is taken from owners manual. How do you reset service light indicator Nissan Rogue. From year: 2011, 2012. INDICATORS FOR MAINTENANCE Nissan Rogue. This indicator appears when the customer set distance comes for service due, for example, for engine oil and oil filter. You can set or reset the distance for service due. (See “TRIP COMPUTER” later in this section.) For scheduled maintenance items and intervals, see your NISSAN Service and Maintenance Guide. 2. Tire replacement indicator Nissan Rogue. This indicator appears when the customer set distance comes for replacing tires. You can set or reset the distance for replacing tires. (See “TRIP COMPUTER” later in this section). 3. “OTHER” indicator Nissan Rogue. This indicator appears when the customer set distance comes for checking or replacing maintenance items other than the engine oil, oil filter and tires. Other maintenance items can include such things as air filter or tire rotation. You can set or reset the distance for checking or replacing the items. (See “TRIP COMPUTER” later in this section.) For scheduled maintenance items and intervals, see your NISSAN Service and Maintenance Guide. To operate the trip computer, use the A switch. When the ignition switch is in the ON position, modes of the trip computer can be selected by pushing the switch A briefly. Fuel Economy -> Average speed -> Driving distance -> Elapsed time -> Range (distance to empty) (dte) -> Settings. When the switch A is pushed and held for less than 3 seconds, the selected item can be reset except for “Range”, “Current fuel consumption” and “Settings”. on the display can be reset except for “Current fuel consumption”, “Settings”, “Range” and “Trip A”. 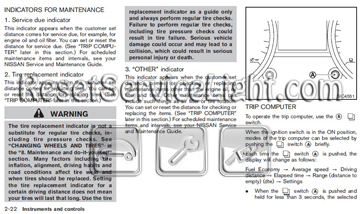 All information how to reset oil service light Nissan Rogue is taken from owners manual. 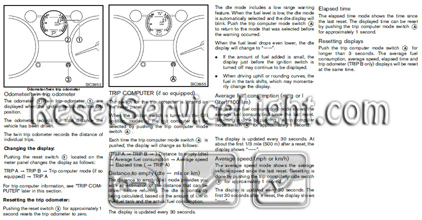 That it is the full procedure how to reset service light indicator Nissan Rogue. If you like to reset any maintenance oil light after an oil change. Or reset check engine light, airbag light, inspection key or insp errors when maint reqd, for Nissan cars. Or any warning light for service reminder which appears on the display. Write in the search box the car name for which you want to find information, and find how to reset other service reminders when by yourself. Click hear to see full procedure how do you reset the oil light indicator. 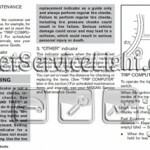 How to reset the maintenance light and how do you reset service light for all Nissan vehicles. How do I turn off the tire maintenance light on my 2013 Nissan Rogue?